The Minister of Budget and National Planning, Sen. Udo Udoma on Thursday announced plans to commence the release of capital expenditure beginning from Friday, May 13 for the implementation of the 2016 budget. 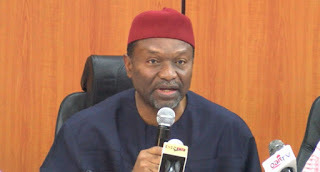 Senator Udoma, who was speaking at the 2016 budget breakdown in Abuja, said the 2016 budget will run till the end of May next year. He also said there were plans by the Federal Government to ensure that the 2017 budget is passed before December 31st. Mr Udoma reeled out figures allocated to various sectors of the economy with a promise that government will waste no time in making releases for the implementation of capital expenditure. He further noted that the federal government has also outlined special intervention programmes to improve the lives of Nigerians at all levels. On her part, the Minister of State for Budget and National Planning, Mrs Zainab Ahmed explained that there is a N500 billion appropriation for special interventions targeted at improving the lives of Nigerians at all levels. The Federal Government is also planning a monthly budget performance report by all ministries, departments and agencies to ensure that the budget is implemented to the letter. Channels TV reports that with special focus on six pillars namely economic reforms, infrastructure, social development, security, the environment and regional development, the budget will focus on building macro-economic stability for the real sector through partnerships with the private sector. Housing projects across the country is to gulp a sum of 35.2 billion Naira and 250 billion Naira will be channelled towards the construction of roads across the country.